The Trump administration announced Friday it is cutting nearly $300 million in planned funding for the UN agency that aids Palestinian refugees, ending decades of support. “The fundamental business model and fiscal practices that have marked UNRWA for years – tied to UNRWA’s endlessly and exponentially expanding community of entitled beneficiaries – is simply unsustainable and has been in crisis mode for many years,” the statement said, a reference to the fact that the agency grants refugee status to all the descendants of the original Palestinian refugees, something not granted to those from any other places. Some 5,000 Palestinians protested Friday along the border between the Gaza Strip and Israel, with some 180 wounded, according to Palestinian reports. The Ynet news site said that a hand-grenade was thrown at IDF troops and that Palestinians also managed to down an IDF drone used to disperse tear gas on the protesters. There were no IDF injuries, Ynet said. Gaza has seen a surge of violence since the start of the “March of Return” protests along the border in March. The clashes, which Gaza’s Hamas rulers have orchestrated, have included rock and Molotov cocktail attacks on troops, as well as attempts to breach the border fence and attack Israeli soldiers. Beinart writes for The Forward, a paper notorious for attacks on Israel and Jews that veer into the anti-Semitic. Typically anti-Semitic Forward headlines include, "3 Jewish Moguls Among Eight Who Own as Much as Half the Human Race” and "Why We Should Applaud The Politician Who Said Jews Control The Weather." "He is largely blind to the harm Jews cause," Beinart railed against Wiesel in terms ominously similar to those used by anti-Semites. Israel, he claimed, "leads gentiles of goodwill to fear that if they criticize Israel they’ll be called anti-Semites." Peter Beinart or Richard Spencer: who wore the bigotry best? 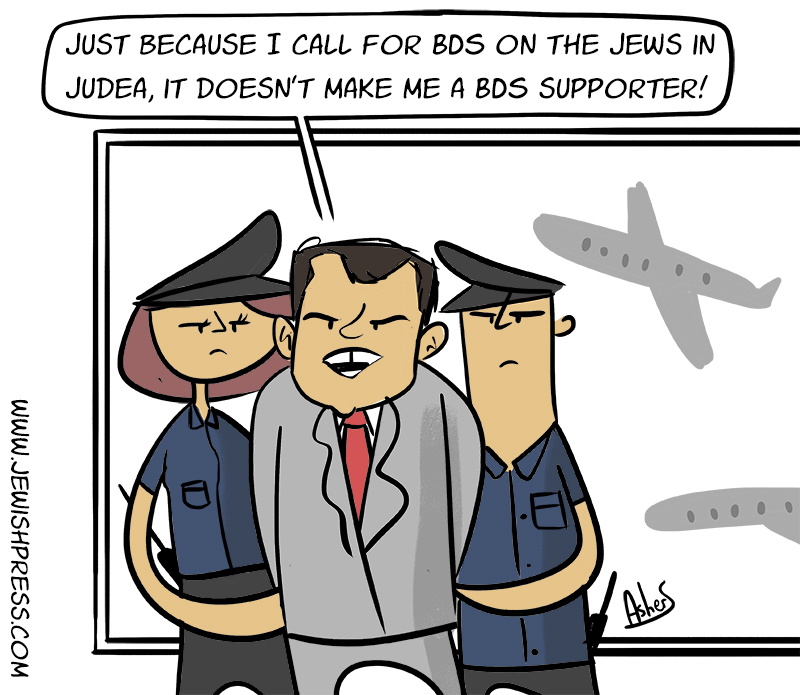 Terrorism is a "response to Israel’s denial of basic Palestinian rights," Beinart has insisted. It’s “the Israeli government is reaping what it has sowed.” His vicious hatred of the Jewish State is matched by his crush on Hamas. "Hamas is the final frontier," Beinart bloviated in 2009. “A shift in US and Israeli policy towards Hamas is long overdue,” he insisted in 2011. And seven years later, it’s still overdue. An exclusive sneak peek at former Secretary of State John Kerry’s upcoming book titled Every Day Is Extra. In the book set to be released on September 4, a copy of which was obtained by Jewish Insider, Kerry writes about the failed Middle East peace initiative he undertook after becoming Secretary of State, what drove his optimism that he would succeed in solving final status issues, how both Israeli Prime Minister Benjamin Netanyahu and Palestinian Authority Mahmoud Abbas failed to live up to expectations, and why the Obama administration decided to abstain at the UN Security Council on UNSC 2334 in December of 2016. British Labour party leader Jeremy Corbyn declared that Zionists "clearly have two problems. One is that they don't want to study history, and secondly, having lived in this country for a very long time, probably all their lives, they don't understand English irony, either." It wasn't their ideology he attacked, but what he deemed their lack of Englishness - that "Zionists" might live in Britain for a very long time, even all their lives, and still remain alien, unable to grasp either history or irony. For this Jew, this was a cut to the quick. For what is it but a sense of history and irony that has sustained Jews through the vicissitudes of their collective experience? Jews are obsessed with history. Every Jewish festival is linked to a moment in the collective history of the Jewish people. The central prayer of every Jewish service describes God as the Lord of Abraham, Isaac, and Jacob. And no sense of irony? Jews have relied on irony to help them traverse the most difficult moments in their history. It was this latest recording from Corbyn that left many Jews utterly convinced that this was a man in whom contempt for Jews ran deep - far deeper than necessary. Maybe Corbyn should be reminded of the retort offered by Benjamin Disraeli, a prime minister of Jewish origin, when attacked in the House of Commons for being a Jew. "Yes, I am a Jew. And when the ancestors of the right honorable gentlemen were brutal savages in an unknown island, mine were priests in the temple of Solomon." 2.5k RTs and 3.5k likes for a completely untrue and offensive attack on the eminent former Chief Rabbi. Labour leader Jeremy Corbyn has been under mounting attack for his own allegedly anti-Semitic positions and for failing to root anti-Semitism out of Labour, Britain’s main opposition party. Earlier this week, Britain’s former chief rabbi, Lord Sacks, called Corbyn a dangerous anti-Semite. Labour dismissed this claim as absurd and offensive. Veteran Labour MP Frank Field has resigned the Party whip over antisemitism in the Party. The move comes as 35,000 people signed our petition in just a few days calling on Labour MPs to leave the Party if Jeremy Corbyn does not resign. Meanwhile, thousands of people have begun changing their profile photos on social media as part of our “Together Against Antisemitism” campaign to show solidarity with Jews against antisemitism in public life. Jeremy Corbyn ignored an invitation from Israel’s Labour Party to visit the Yad Vashem Holocaust museum in Jerusalem, the party’s former leader has said. Isaac Herzog told the JC he wrote to the Labour leader to make the offer in March 2016 but never received a reply. He continued: “It’s good that there’s a clear and sharp protest from the Jewish community in Britain and that the political leadership in Israel has echoed them. But the Labour Party denied Mr Corbyn had never sent an answer. Jeremy Corbyn held a private meeting with a Holocaust denier in Parliament and failed to disclose it when quizzed by a Home Affairs select committee inquiry into anti-Semitism, MailOnline can reveal. When giving evidence to the select committee in 2016, Mr Corbyn admitted attending public DYR events but claimed to have stopped when he learned of its leader’s views. The Labour leader continued to attend DYR public events for a further six years, however, and is today exposed as having met privately with them in Parliament a year later. Barely a morning has passed without new revelations about Jeremy Corbyn’s past associations with a motley crew of anti-Semites, terrorists and Israel-haters. Last week’s disclosure of a video showing the Labour leader suggesting in 2013 that British Zionists “don’t understand English irony,” despite “having lived in this country for a very long time,” brought the whole ghastly show to an abysmal nadir. It is therefore grimly appropriate that, as parliament returns September 4 and the new political season commences, the battle begins where it ended in July: with another row over whether the Labour party will adopt the International Holocaust Remembrance Alliance definition of anti-Semitism. This summer’s crisis — the latest episode in the row over Jew-hate within the party’s ranks, which has regularly rocked the party throughout Corbyn’s three-year leadership — was triggered by Labour’s decision in July to write its own definition of anti-Semitism. Quite deliberately, the party’s governing body, the National Executive Committee (NEC), adopted a code of conduct which omitted key illustrative examples of anti-Semitism — all of them relating to criticism of Israel. These guidelines matter: they will be used by Labour to decide the huge backlog of up to 300 complaints against members who have been accused of anti-Semitism and whose chances of escaping disciplinary action were immeasurably aided by the NEC’s stance. It is easy to see why Andrew Murray has been welcomed to Jeremy Corbyn’s inner circle. He is a fanatical Israel hater. Consider a scene from London in July 2006, when Murray, Corbyn, far left agitators and Islamists marched to protest against Israel’s bid to defend itself against Hezbollah. Excited, Murray reads a message from Hezbollah to a cheering crowd. It is addressed to “our friends from around the world” from the “freedom fighters of Hezbollah”. Unity! Listen for yourself. However, left-wing leading members of the Stop the War Coalition, including George Galloway and Andrew Murray, not only failed to raise socialist ideas but also expressed uncritical support for the Islamist Hamas and Hezbollah. For his part, Jeremy Corbyn shouted about Israeli “state terrorism” and told the crowd it was important that they had assembled because the demonstration would be reported on television. For him, the nasty scenes were a matter of pride. Hezbollah is not enough for Andrew Murray. As readers know, he also supports “resistance” against NATO forces. Our soldiers on active duty overseas? Best kill them. The Salazars said there were times when money was a bit tight, such as when Luis Hernan Salazar was briefly laid off or late in his life when he went on disability. But they denied the assertion on Julia's campaign website that she began "working at a local grocery store when she was 14 to help make ends meet." Christine Salazar said she encouraged her children work to build character and because they didn't get an allowance, not out of necessity. Salazar's family also denied the candidate's claim that she spend her childhood moving back and forth between Florida and Colombia. The family made a few visits to Colombia they said, but never lived their permanently. "Maybe she was just referring to going there more than we went anywhere else," her mother suggested. Another fib from Salazar was her claim that growing up, "We didn’t all have permanent residence in the U.S." By the time she was born, every member of the family was a U.S. citizen. The Daily Freier asked Ms. Salazar the name of the Rabbi who converted her, and she quickly answered that it was Krusty the Clown’s dad from the Simpsons he works at the same Shul where Tim Whatley converted in the ‘Yada Yada Yada‘ episode. When the Daily Freier tried to delve further into our claim, she accused us of being “Anti-Dentite“. A student at Tufts University in Massachusetts has condemned an upcoming class led by a instructor who previously suggested that the entirety of Israel is occupied Palestinian land. As the Jewish News Syndicate first reported, the course will be taught by Thomas Abowd — a lecturer in American Studies and Colonialism Studies — starting next week. It will help students “address crucial questions relating to this embattled nation, the Israeli state which illegally occupies Palestine, and the broader global forces that impinge on Palestinians and Israelis,” according to its description. Zeff noted that this summary does not mention any “Jewish writers or filmmakers,” and warned that the exclusion of “any non-Palestinian perspective” may prevent students from properly examining the subject matter. will develop an understanding of Palestinian history, political structure, development, culture and society. With one stroke, the West Bank becomes Judea and Samaria, Nablus becomes Schem, al-Khalil turns into Hebron, and the Occupied Territories become the Area, the administered Territories or the Territories. Language becomes a mechanism to disguise and conceal the reality, a mechanism to present an alternative reality by giving it new packaging. I would maintain that that semantic sleight-of-mind is exactly what the Arabs-called-Palestinians have done and do to Eretz-Yisrael. By the way, Nablus is the Arabic pronunciation of Neapolis, the Roman name for Shchem, just as Filastin is the approximation in Arabic pronunciation (the language has no 'P' sound) of Palestina, the Latin term the Romans awarded vanquished Judea. On South African TV, BDS-hole Muhammed Desai challenged champion debater, writer, analyst and commentator Jamie Mithi, who opposes BDS (and BS). Muhammed Desai never stood a chance. In an apparent victory for boycott Israel activists, American singer Lana Del Rey on Friday canceled her show in an Israeli music festival set to take place next week. Del Rey said that due to scheduling constraints she would not be able to play in front of both Israeli and Palestinian crowds, and decided to cancel her performance at the Meteor Festival in the Galilee as a result. “It’s important for me to perform in both Palestine and Israel and treat all my fans equally,” Del Rey wrote on Twitter. Nation of Islam leader Louis Farrakhan was seated on the stage at Aretha Franklin's memorial alongside Bill Clinton, Rev Jesse Jackson and Rev Al Sharpton. Photos and livestream video show the controversial religious figure and black nationalist front and center at the star-studded service honoring Franklin, who died aged 76 from pancreatic cancer on August 6. 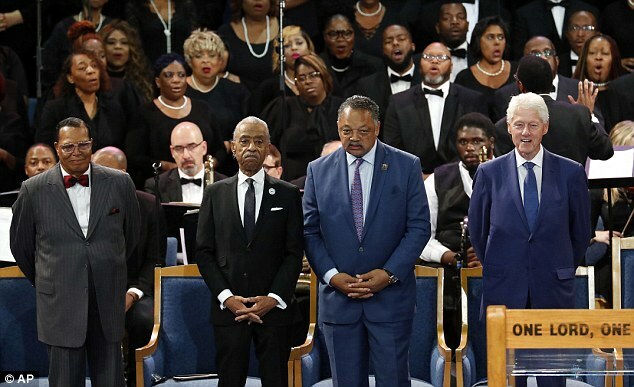 At points during the five-hour-long service, Rev Sharpton appeared to be leaning away from Farrakhan and whispering to Rev Jackson to his left, who is seated next to former President Clinton. Farrakhan detailed his long relationship with Franklin in a statement issued after her death earlier this month. Tel Aviv (Tribune News Service) - Economic cooperation between Japan and Israel is being stepped up: the Japanese External Trade Organization (JETRO), a Japanese governmental agency, is opening a business center and accelerator program for Israeli startups. The center will support Israeli startups and mediate business cooperation between Japanese and Israeli companies. The JETRO center is focusing on support for Israeli companies in the founding stages and the expansion of their business to Japan. JETRO promotes bilateral trade and investments between Japan and the rest of the world. As part of its activity, JETRO operates the Invest Japan program aimed at helping foreign companies wishing to develop their business in Japan. The program includes a great deal of information for foreign investors about all aspects of doing business in Japan by providing professional consultation and temporary office space for free in large business centers throughout Japan. Under the name Global Acceleration Hub (GAH), similar Japanese centers operate at 12 sites around the world. The JETRO program is designed for Israeli startups interested in finding fruitful ground for cooperation with Japanese companies. The center's personnel will assist with information about the Japanese market and in finding suitable companies for cooperation. In cases in which such a company is found, the center is likely to obtain support in establishing a presence for the Israeli company in Japan. Track160, a Petah Tikva-based Israeli startup developing a fully automatic team sports analytics service using deep learning technology, won first place in the 2018 European SportsTech held during the SpielMacher conference in Hamburg on August 9. The victory cup was awarded to Track160 cofounder Miky Tamir. Tamir established Track160 in 2017 with fellow sports technology and computer vision expert Micha Birnboim. Their fully automatic system tracks player and ball position and produces performance and tactical metrics, without GPS sensors, RF receivers or human operators. The patented technology combines a single-viewpoint camera unit (two handycams or any professional video unit on the customer side) and miniature low-cost tags worn by the players. Later on, the system will become “pure optical,” the company says. Based on the players’ IDs, locations and ball position, Track160 automatically prepares a comprehensive team/players game analytics database as well as injury and roles predictions. [A]rchaeologists are excavating strange ruins previously found in inhospitable parts of the Jordan Valley, hoping to prove or disprove the theory suggested by the late Adam Zertal of Haifa University: that the stone structures found there were erected by the ancient Israelites as they slowly crossed into Canaan 3,200 years ago. Interestingly, if the Israelites did build these structures, they may have done so to shelter not themselves but their livestock. . . .
[A] meticulous survey of 1,000 square miles of the western part of the Valley, headed by Zertal and his team from 1978 onward, found the remains of hundreds of ancient settlements. (One seems to be shaped like a foot, with toes and all.) Of the hundreds, Zertal estimated that about 70 had been erected in the early Iron Age. That is, about 3,200 years ago, which is when the ancient Israelites were said to have been led by the Prophet Joshua from the wilderness to fertile Canaan. . . .
No signs of the builders’ identity have been found thus far. The only reasons to associate the structures in the bitterly inhospitable valley with the ancient Israelites are their location and the estimated timing of their erection. [The current excavation] began with a large and very strange settlement called Khirbet el-Mastarah (loosely translated as “hidden ruins”). While today the only sign of life there is the occasional Bedouin shepherd passing by with his herd, Mastarah seems to have once housed a large Iron Age village. . . Speakers at Friday’s memorial ceremony marking the second anniversary of the death of Shimon Peres, Israel’s ninth president and two-time prime minister, praised the late leader as man who aimed to unite the nation, strived for peace, and sought to strengthen the moral character of the Jewish state. Peres dreamed of “the image of the state before it was established and afterwards become one of its best builders, and one of the most prominent of its visionaries,” said President Reuven Rivlin, who spoke at the event at Jerusalem’s Mount Herzl, where Peres is buried in the Great Leaders of the Nation section. The event, which was organized by the Peres Center for Peace, was also attended by IDF Chief of Staff Gadi Eisenkot and Jewish Agency Chairman Isaac Herzog.